It’s been weeks since I posted a seafood dish. Once Fall arrives and the Holidays are upon us, we seldom cook seafood. We will do various cream soups, meat stews, some braises, a lot of turkey, some chicken and pork. This, of course, does not include all the Holiday cookies, candies and treats, not to mention dining out with family and friends. All of these Fall and Holiday dishes and festivities are luxuriously rich and pack on the calories. During this period I don’t even step on the scales. Why bother? I don’t intend to eat less or change my diet because it’s the Holidays and Holidays are meant to bring good cheer to everyone. This means indulgence is the order of the day during the Holidays. After New Year’s Eve, I will finally weigh myself to see what damage I have done. 😮 Thereafter, we try to eat a little more sensibly which includes less quantity coupled with more low carb meals, more soups, more salads and more fish in our diet. Now, notice I said, less quantity, not less quality. There is absolutely no reason to sacrifice quality because you are on a diet. In fact, the better the quality of your meals, the more likely you are to keep to your diet. The last thing you need is to go on a diet where everything tastes like Gerber’s baby food or unseasoned mashed potatoes. See how long that diet will last! This dish is one of those low carb, seafood salads designed to help me fit back into my clothing. We got the idea for this salad because we had some nice shrimp in the freezer and a friend of mine had just given us some fresh, homegrown, tree ripened Meyer lemons from his trees down in Richmond, Tx. They were the largest Meyer lemons I have ever seen! Here’s a photo to put them into perspective. They are so big, full of juice and mildly sweet. 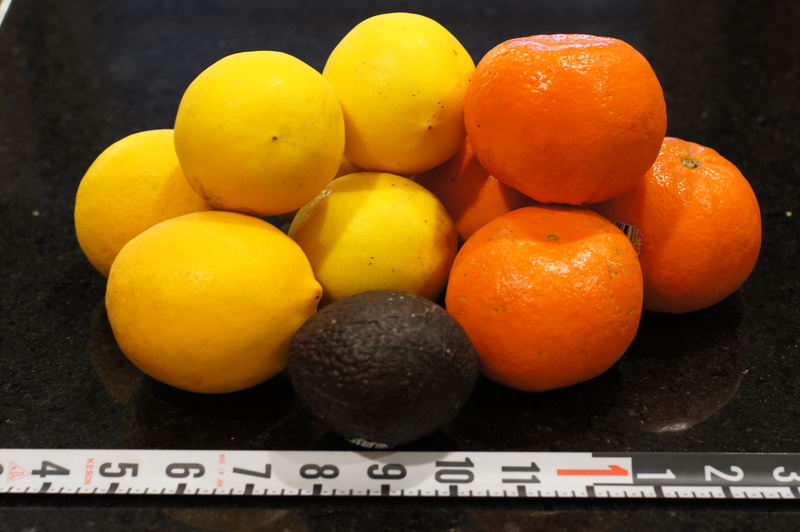 Inasmuch as we had these beautiful Meyer lemons, avocados, shrimp, a beautiful red mango, and oranges, a salad was definitely in order. This salad is full of fresh flavors with differing textures to tantalize your taste buds while keeping you healthy. It’s a wonderful salad that makes the perfect lunch. It also works well for an appetizer, just adjust the portion size. Of course, if you’re still young and can eat everything in sight, don’t worry about adjusting the portion size. 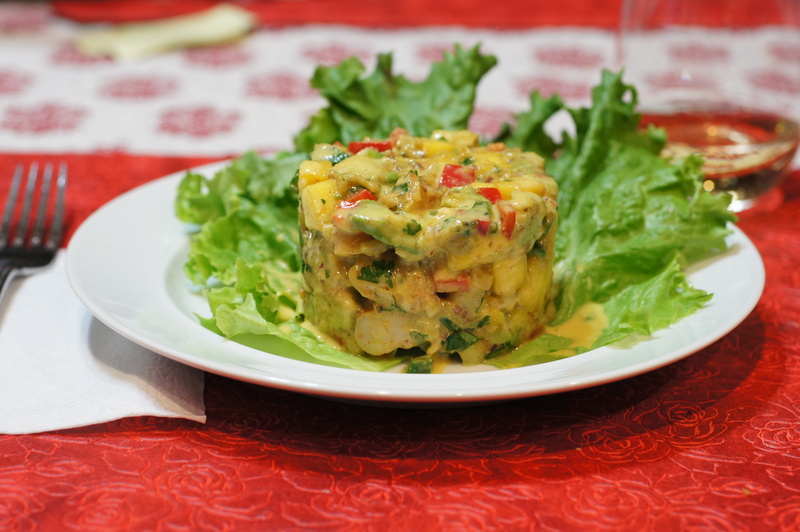 🙂 Whether as a nice lunch, light dinner or as an appetizer this is a delicious salad we hope you try. Baby Lady kept getting ahead of me on this recipe so there aren’t many photos of the dressing prep but it’s easy, so no loss. 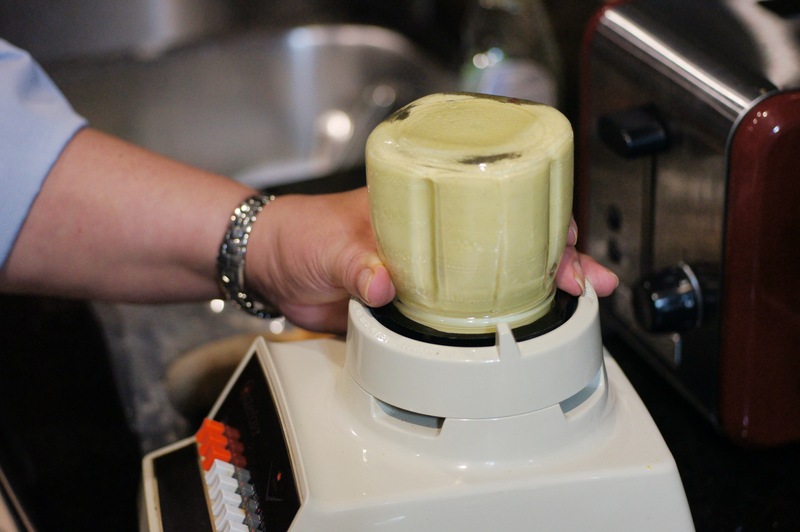 Put everything in a blender and blend to thoroughly emulsify. Mix the Ancho Chile Rub and Old Bay together. 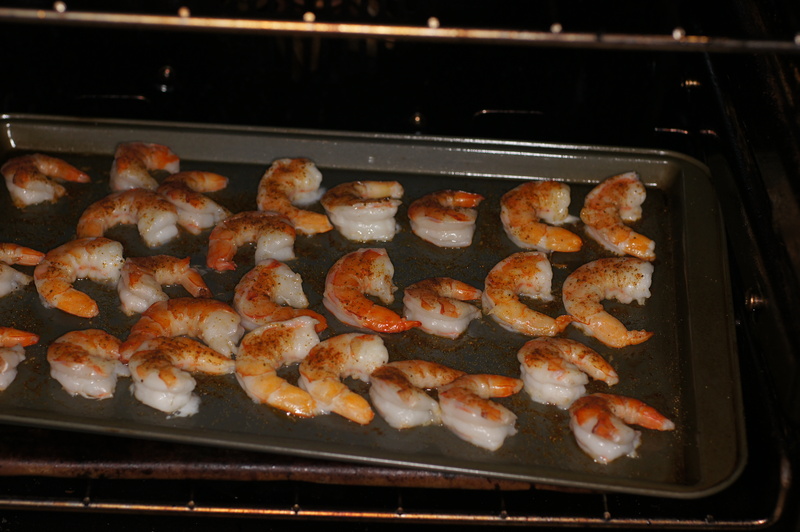 Season the shrimp with the mixture, place in 350 F oven and roast. After 4 minutes remove from the oven and allow to cool. Chop and set aside. 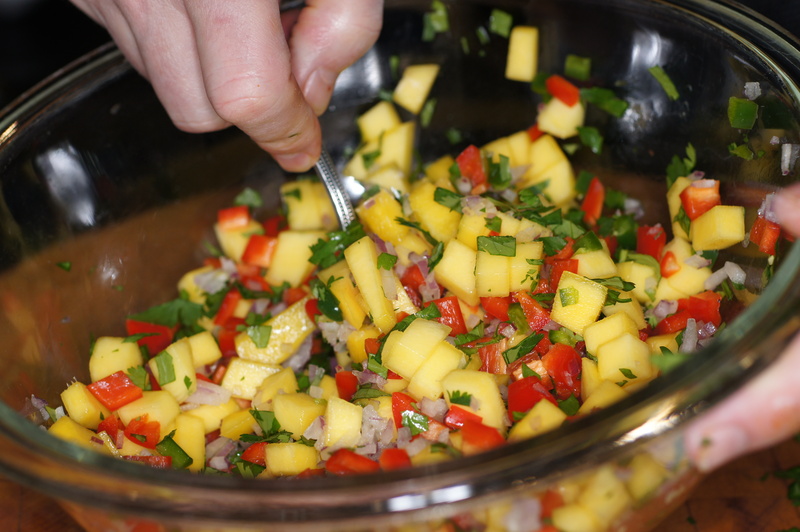 In the meantime, prep all of the fruit and veggies for the salad, starting with the mango. Isn’t that a beautiful mango? 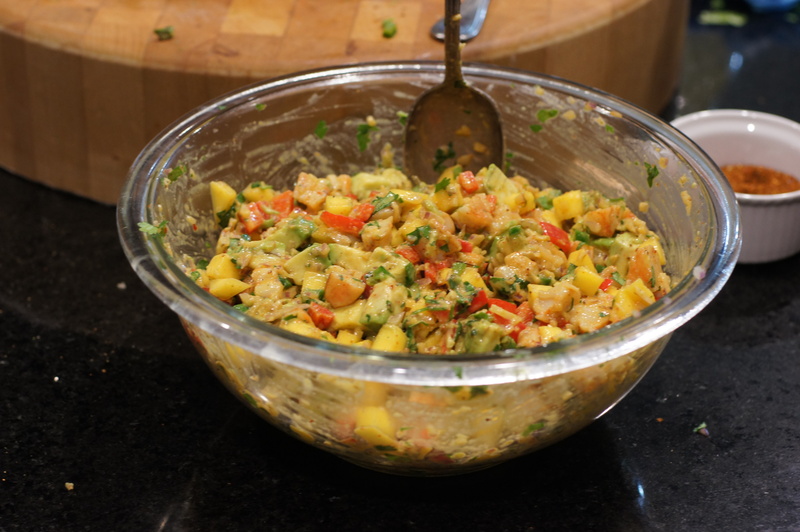 Place all of the fruit and veggies, except the avocado, in a bowl and toss to combine. 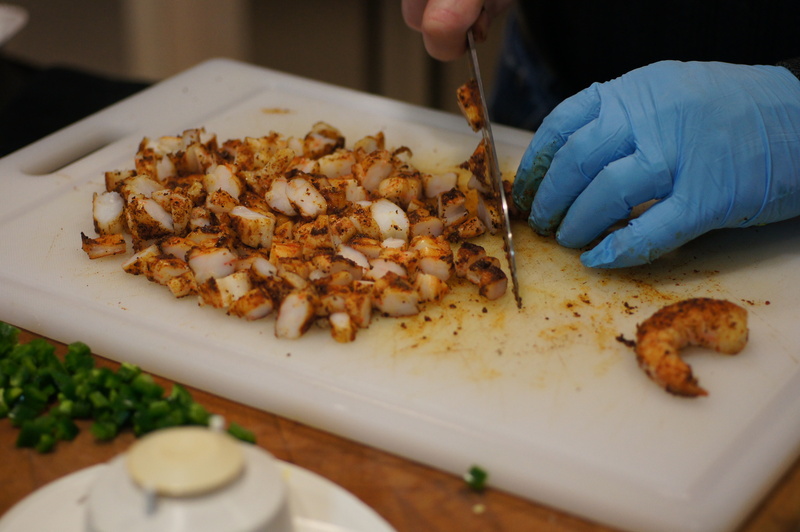 Now, add the chopped shrimp and toss. 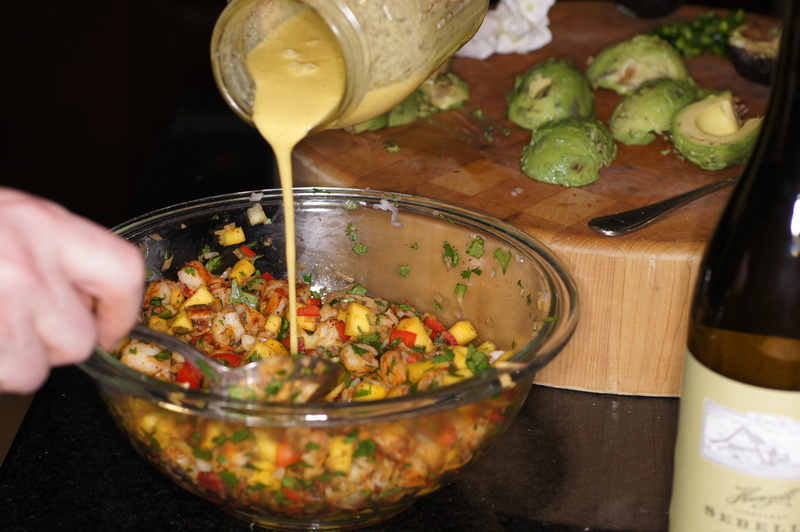 Add roughly 1/2 cup of the dressing (enough to allow the salad to hold together, and toss to combine and incorporate flavors. 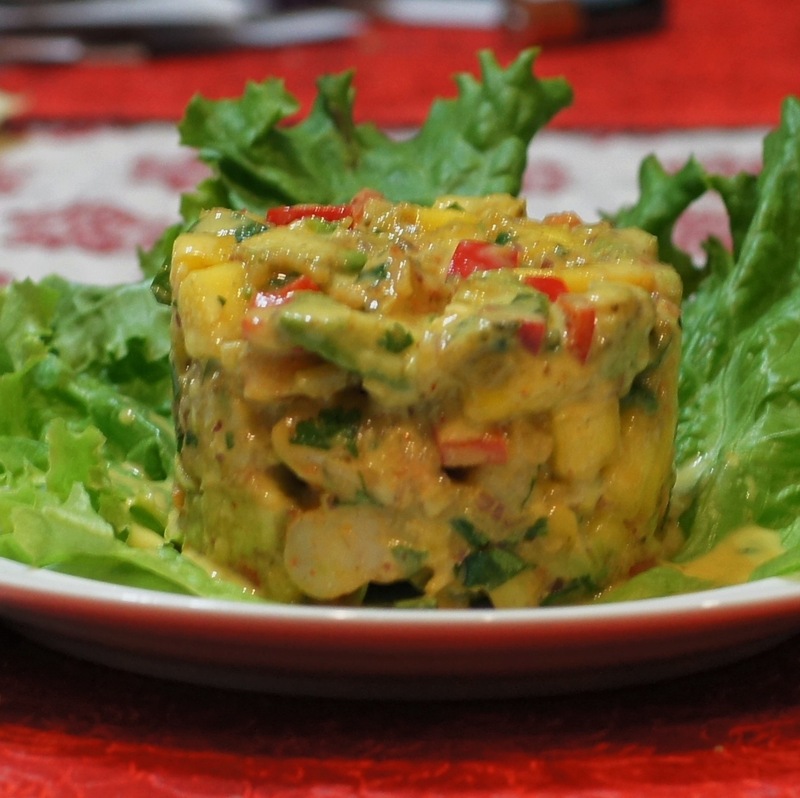 Add the avocados at the end and gently toss to incorporate but not break up the avocado pieces. 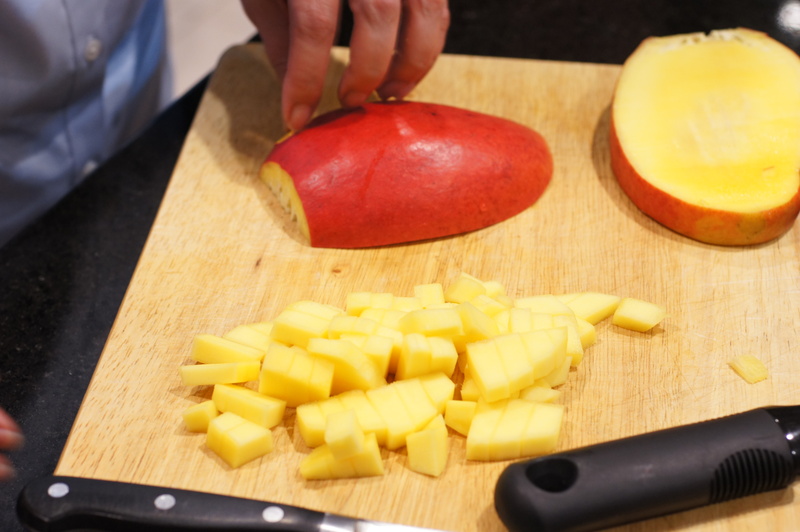 Fresh fruit & prawns are a waist & tummy pleasing combination! 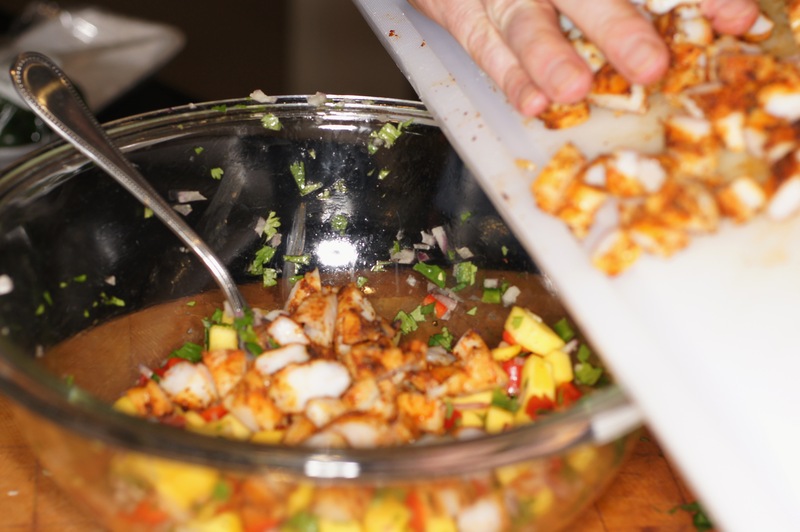 I love fresh salsa style seafood and with your ancho chilli rub I’m sure it’s the tastiest boost your metabolism will love too! Thanks, Alice. 🙂 I bet these would be great with homemade, fluffy, airy, buttery croissants. I even know where you can find a good recipe, too. It’s a shame I’m on a diet. Great looking salad that must have loads of flavor. I grew up in Richmond…small world. I love the presentation, very professional! With the snow here right now I’ll wait a bit with making a shrimp salad, but this sounds delicious.